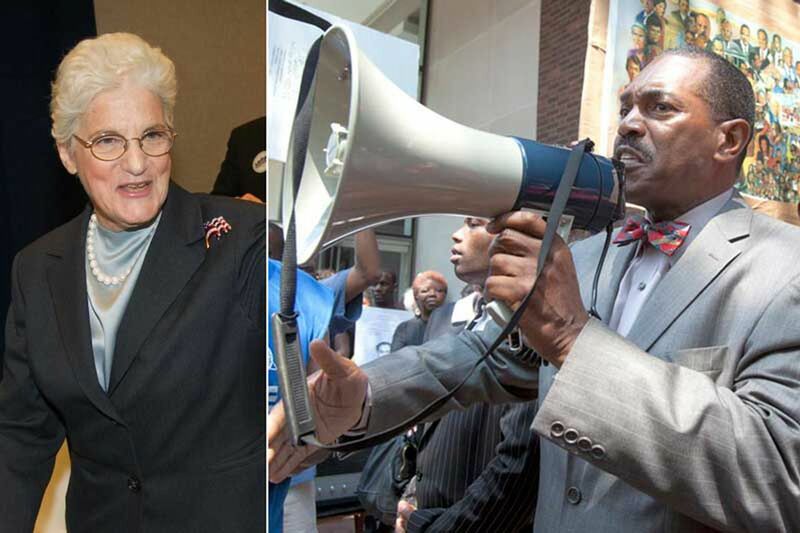 Former DA Lynne Abraham (left) and NAACP Rodney Mohammed. A day after Philadelphia NAACP president Rodney Muhammad slammed her as a "menace to society" unfit to serve as interim district attorney, former District Attorney Lynne Abraham accused the Nation of Islam minister of being a leader in name only who has failed to address pressing crime issues impacting the city's black community. "He sounds ridiculous, and I would never withdraw my name from anything, no matter what," said Abraham, one of 14 candidates who have submitted their names to an 88-member board of judges scheduled to select an interim Philadelphia district attorney Thursday to complete the 5½ months remaining in the term of disgraced ex-District Attorney Seth Williams. "Unless I missed it, he hasn't spoken out once about the homicide rate in the community, including [four] this weekend. He never uttered a peep about Seth Williams and all the bad things he confessed to doing, which were federal crimes. He has not said a word about the opioid crisis. So, as far as I'm concerned, he's been asleep. He's Rip Van Rodney," Abraham said in an allusion to the fictional Rip Van Winkle, who took a 20-year nap. "He's supposed to be a leader. What's he been leading? The fact that I woke him up, I'm glad about that because he's been asleep at the switch," said Abraham, who suggested that Muhammad attacked her in such harsh terms because she is a woman. "He would not talk to me like that if I was a guy. He thinks he can push me around. But he's not going to." Abraham, who served as district attorney from 1991 to 2010, said that if selected to serve as interim district attorney she would not take a salary, a pension, or any other compensation. "I'm doing this out of a pure sense of duty and obligation to the court, the victims of crime in Philadelphia, and to try to reset the office," she said. "There's a lot angst in that office. People are leaving in droves. It's a wreck. You need somebody with a strong sense of duty and the capacity to calm things down so we regain our sense of mission and duty and so that people feel safe in their communities," she said of the office that had been headed by Williams before he pleaded guilty to a corruption charge in federal court last month. He is jailed and awaits sentencing. Muhammad, who was elected president of the local NAACP branch in December 2014, said Sunday that Abraham's contentious history with the city's black community makes her unacceptable to be the city's top prosecutor for even a stint. "Six months is enough time for Lynne Abraham to really do some damage," he said. "We don't want her in there 24 hours." He cited her 1996 statement that blacks commit 85 percent of the city's crime and her vocal opposition to President Bill Clinton's nomination of Common Pleas Judge Frederica Massiah-Jackson to the federal bench. Massiah-Jackson, who would have been the first black woman from Philadelphia to serve as a federal judge, withdrew her nomination due to opposition from Abraham and others. Abraham said she had misspoken when talking about the overall crime rate, and previously had clarified that she was referring to the homicide rate. "It came out the wrong way, and I'm sorry for that," she said. She said she had no animus toward Massiah-Jackson and had suggested to then-Sen. Arlen Specter several other black women for nomination to the federal bench. "I took a stand [on Massiah-Jackson] and I stand by that," she said. "If Rodney wants to hold that against me, that's fine." Abraham added that despite what some of her detractors say, she's no racist. "The people who are my biggest supporters, many of them are African Americans," she said. "How do you get elected in Philadelphia eight times with no votes from the African American community? People know who cares about them, and I care about everyone."